People have gotten creative in what they ask friends, family and strangers to pay for via crowdfunding. This particular purpose stands out above the rest, though, and makes up a huge chunk of crowdfunding requests: paying down medical bills. Unfortunately, crowdfunding is a pretty ineffective way of alleviating medical debt, according to a recent NerdWallet study. In an analysis of five platforms, only 11% of campaigns with this purpose were fully funded in 2015. But if your family’s been hit with unexpected medical expenses and has no way to pay for them, you may have considered crowdfunding the money. Sometimes it seems like the only option. It found a shocking average of 41% of all crowdfunding campaigns on these sites in 2015 were for medical debt. Think of all the odd things you can crowdfund! Weddings, honeymoons, creative projects, vacations, scholarships, adopting a baby, charitable giving… all these (and more) combined to make up the other 60% of campaigns. They’re all dwarfed by medical crowdfunding. The average goal per medical campaign in 2015 was $15,721. Given that many Americans gained health insurance through the Affordable Care Act, why are we turning to strangers to pay the bills? The number seems staggering, until you break it down. Serious illnesses and diseases are the most common reasons for medical crowdfunding. These ailments come with tons of charges for doctor visits, costly treatments and prescription drugs. On top of that, most of these campaigns seek funds to help cover the cost of living for the patient or caretaker, GiveForward CEO Josh Chapman told NerdWallet. Families need to cover lost wages, unusual transportation and child care as they cope with illness. GiveForward says about 70% of medical fundraisers are for people recently diagnosed with cancer. 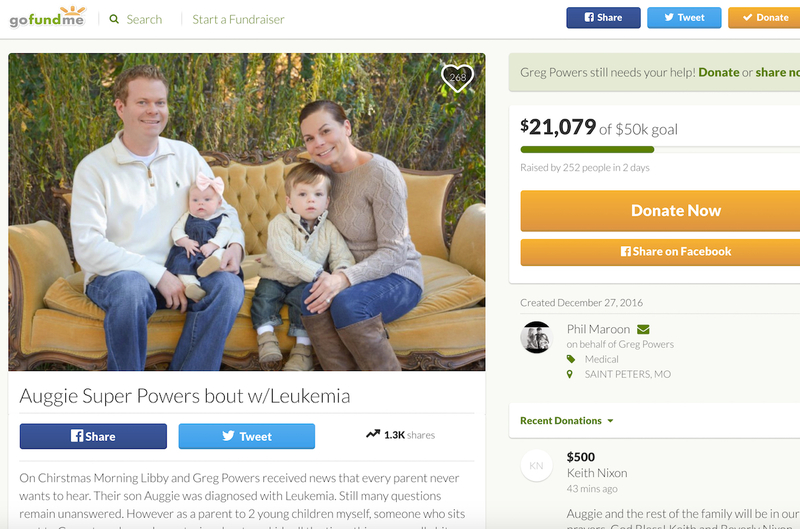 What Makes a Medical Crowdfunding Campaign Successful? If you find yourself running a crowdfunding campaign to cover unexpected medical bills, the study reveals a few helpful tips. First, fully funded medical campaigns saw an average of nearly 55 contributors. Do the math: That would mean contributors giving about $285 on average. Those $5 and $10 contributions from well-meaning Facebook friends are helpful, but you’d need to appeal to a ton of people to hit your goal with those. Fifty-five is a doable number… as long as you know that many people with a few hundred dollars to spare. Second, most platforms charge processing fees, so consider those when setting your goal. On top of that, FundRazr, GiveForward and GoFundMe also keep 5% of donations. Third: Typically, a friend or family starts a campaign on the patient’s behalf. Even with the best advice, the odds are stacked against a successful campaign. So what do you do about that remaining medical debt? It may not eliminate all of it, but try these tips for saving money on your medical bills. We also talked with experts to give you the best ways to stay on top of your medical debt, and what to do if you receive a bill in error. If you’re a caregiver who has to cut hours or leave your job altogether, look into ways to make money at home.